We offer Professional Website Translation Service for all types of websites and almost all languages. 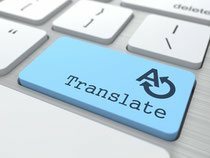 Our website translation service is performed by qualified, experienced and native translators, which will be carefully selected for your website translation project, taking into consideration the sectors, market and subject of your online contents. Get a Free Quote. Simply send us the text contents of your website in one of the following format; DOCX, DOC, HTML, XML, XHTML or XLSX. Any other formats can be discussed. The text files can simply be Word or Excel files. Please note that sending a website link by itself is not enough to get a quote as there is a possibility of missing a page or section during the process. Therefore, we recommend our clients to send us text files as mentioned above. Get a Free Quote. 37% of Internet users spend more time on sites written in their own language (source: Common Sense Advisory). Internet users are four times more likely to buy or order from a site that communicates in their language (source: International Data Corporation). Website visitors stay for twice as long if the website is in their own language (source: Forrester Research). High-quality translation done by specialist translators. We cover all sectors and websites content. Competitive price rates for all languages. All projects are treated with complete confidentiality. Should you have any question about website translation service, please feel free to contact us or Get Free a Quote.